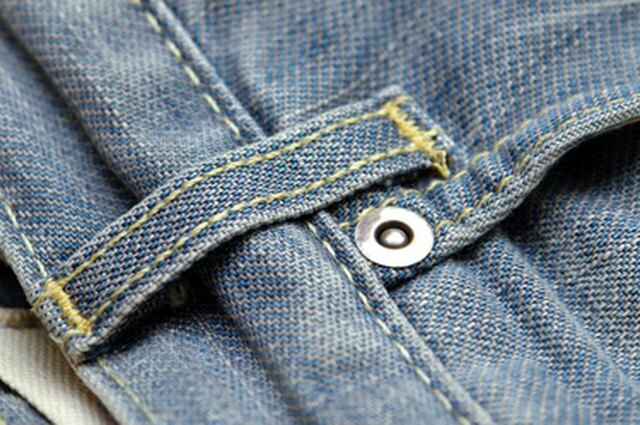 Rivet buttons are those small, metal nodules which you find on certain types of pants. They are normally found on pockets. The benefit of removing them is that you can replace them with new ones in order to give your clothing a new lease on life. Alternatively, if the rivet buttons have become damaged, you can just throw them away. Removing the rivet buttons is easily done with a few household tools that you can find in your kitchen drawer or at a local hardware store. Place the fabric that contains the rivet button on a flat, steady surface. Make sure you have enough space to work in, to avoid knocking something over with an enthusiastic elbow. Place the flattened head of the screwdriver underneath the edge of the rivet. The rivet is made from two separate metal pieces; therefore you need to pry them apart to remove the rivet button. Push the handle of the screwdriver upwards, to pry the top part of the rivet button away from the bottom half. You might have to be firm when wedging the head underneath the rim of the rivet, as they are secured tightly to the fabric. Repeat steps 2 and 3 until the rivet head has been pried off, or has become loosened by the use of the screwdriver. Grip the pliers, and use them to hold onto the bottom half of the rivet button. Pull the rivet from the fabric. Wriggle the pliers back and forth to loosen the rivet button, if it does not want to budge. Keep using this technique and the leverage of the screwdriver. Eventually, you'll be able to release both parts of the rivet button by repeating these steps.